Readers of this blog will have noticed that we have been focusing intensively on the centenary of World War I. Alongside the usual wide range of research, one in five visits to the Library this year have been by readers researching World War I topics – the Quaker peace testimony, conscientious objection to military service, war relief work and the lives of individuals involved. Enquiries to the Library on these subjects have gone up too, not least from Quaker Meetings organising local events and exhibitions around the country. In particular, there is a demand for images for illustrations and displays, and our colleague Melissa Atkinson has been busy researching the image collections for World War I related material. We asked her for a personal highlight. With the WWI centenary upon us, the Library has been inundated with enquiries. I have discovered so many interesting visual items that it is hard to single one out. I have chosen to write about a photograph album that has gripped my attention (Library reference TEMP MSS 881/ALB). 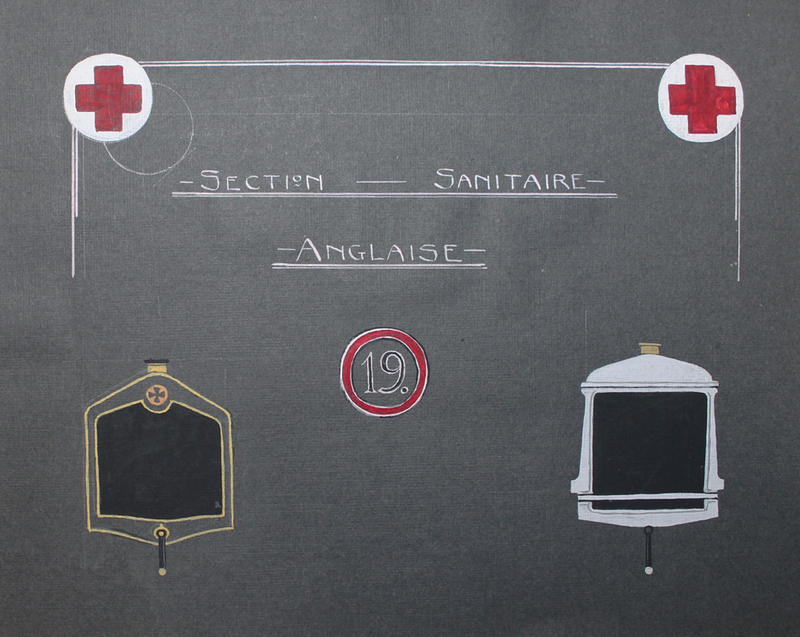 As with any photo album, a story unfolds after every page and I am captivated by the visual story told by its young creator – (Philip) Alan Burtt (1897-1991) who volunteered with the Section Sanitaire Anglaise 19 (SSA19). The Sections Sanitaires Anglaises, collectively referred to as “the French convoys”, made up the Belgian and northern French section of the Friends Ambulance Unit (FAU). They helped transport wounded soldiers from battlefields to hospitals as British motor ambulance convoys working under the French army. FAU was one of the voluntary Units along with the Order of St. John Ambulance and of course the British and American Red Cross. This album traces Alan Burtt and his unit’s movements around the towns of Coxyde, Zuydcoote, Nieuport, and Pont D’Oye the coast, the trenches and the combat zone. Alan Burtt was still at Sidcot School when war broke out, and a keen member of the school photography club. While at Sidcot, he would have heard first-hand accounts of conditions on the continent from the former pupils who came back to talk about their war service, whether in the FAU, doing relief work with civilians, or in the army. Alan Burtt signed up for the FAU in July 1915, and trained at Oxhey Grange, Hertfordshire, before leaving for Dunkirk in January 1916 aged 19. He was stationed with SSA19 from October 1916 to July 1917, working as an orderly and driver. He transferred back to England to the FAU agricultural section and worked with the Wensleydale Pure Milk Society (a Northallerton dairy farming cooperative founded in 1905). After about a year, he undertook further relief work with the Italian Ambulance Unit which was administered by the British Red Cross. Like many other albums, autograph books or scrapbooks in the Library, Alan Burtt’s photograph album is a compilation of material from various sources – his own photographs, photographs taken and exchanged by comrades, and copies from official sources (in this instance, French Army photographs). Nonetheless, this a quite a memento for a desperate time. I find the collection both poignant and fascinating. For me, as a curator, these images reveal an aptitude for photography, and sensitivity to the subject. Even though an amateur photographer, Alan Burtt manages to balance devastating subject matter with poetic landscapes and personal experiences. This entry was posted in Highlights and tagged archives, Friends Ambulance Unit (1914-1919), Philip Alan Burtt, visual resources, World War I. Bookmark the permalink. Trying to trace my Grandfather Thomas Birkett of Wigston, who converted his Argyll car into an ambulance and joined the FAU in Fraance. He played his guitar to the troops in the evnings. You can see his FAU personnel records online, complete with photos! We have digitised the World War I FAU personnel cards and they are freely searchable online (http://fau.quaker.org.uk/). Thomas Birkett’s cards are here. For more information about the records of the Friends Ambulance Unit during World War I, see our blogpost from last year. Hi there, how interesting, I am the grandson of A Wiles featured in this album, I have a small collection of photographs of the SSA19 crew around the same period including Punch!!! I am planning a trip to Amiens this month, I plan to investigate the cellar at Doman sur la luce. I would love to swap any further information you have. How marvellous – what a lovely collection to own We’ve just received your email message too. We’ll be in touch soon.